Certified food-grade reusable straws, with a plant bristle cleaning brush and a GOTS certified organic cotton carry pouch. Comes in recycled card packaging. Set of 6 smoothie straws or a set of 6 standard straws. 100% Vegan & free from micro-plastics! This set took a year to put together and is rigorously tested for safety and for the least amount of impact on our environment. Help eliminate the millions of plastic straws used every day with these premium food-grade, reusable silicone straws. 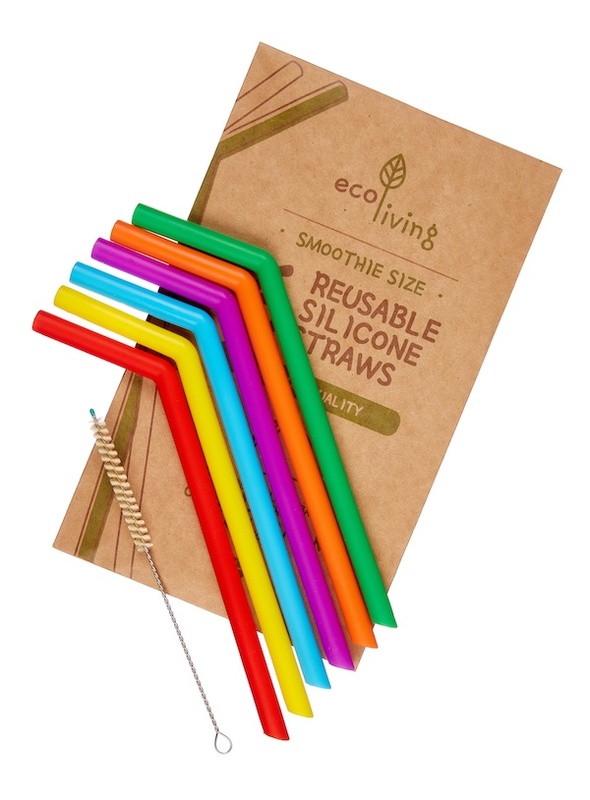 Available in a 6 pack of wide smoothie straws or standard width straws. This set includes a biodegradable plant bristle cleaning brush(no plastic!) and a GOTS certified organic cotton carry pouch. 100% Vegan. 100% Reusable & Recyclable at the end of their long life. The wide 9mm inside diameter straw is perfect for smoothies. 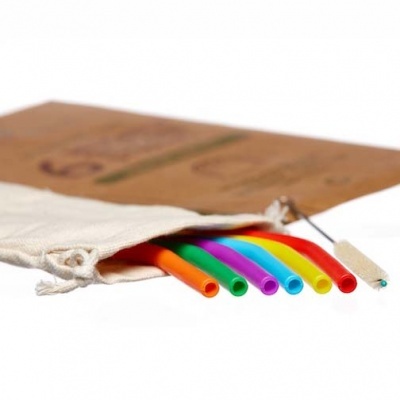 The standard straw has a 5mm inside diameter and is a suitable everyday straw. FDA/LFGB certified food-grade silicone reusable straws, with a plant-based cleaning brush. Comes in recycled card packaging. The safer, non-toxic and eco-friendly way to sip! Each silicone straw is tested safe to EU standards and is free from any plastic fillers! Made with 100% food-grade silicone, no plastic fillers! A simple way to test for fillers in silicone is the pinch test. Simply pinch, twist, or pull the silicone, if it turns white then it has fillers! 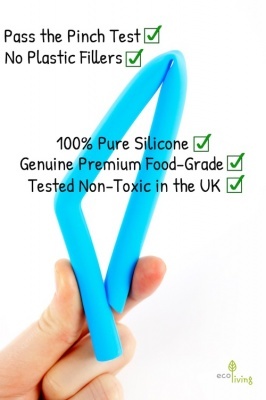 Our straws use 100% pure silicone, which is tested non-toxic in a UK test centre. The bristles on the cleaner are made of plants and the metal on the cleaning brush handle is made of 304 food-grade stainless steel. 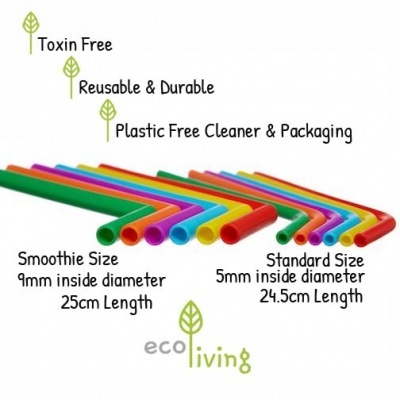 The 25cm LONG SMOOTHIE STRAWS FOR DRINKWARE UP TO 19.8cm TALL. Working with both 20oz and 30oz tumblers. The 24.5cm LONG STANDARD STRAWS FOR DRINKWARE UP 19cm TALL. Suitable for 20oz tumblers. 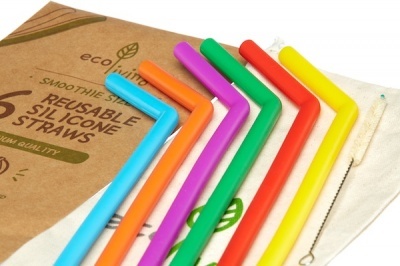 This 6 pack of reusable silicone straws includes a GOTS certified organic cotton travel pouch and a plant bristle cleaning brush. Available in a smoothie or standard size. Please see photo gallery for a size comparison. BPA free, Lead-free, Phthalates free. No more plastic or paper straws to throw away! Juice, ice tea, smoothies or cocktails, kombucha, whatever yours or your kids' favourite drink, a reusable straw completes it. With a handy vegan plastic-free cleaning brush to wash them out clean. Straws can be washed in dishwasher, handwash to prolong life. Reusable for many years. At the end of their long life, you can return them to Boobalou who will recycle them with TerraCycle. 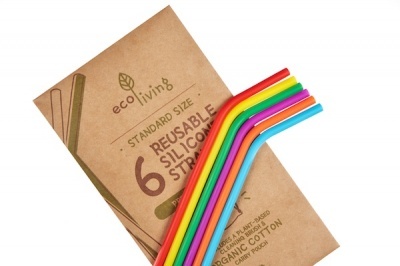 - 6 bright rainbow colour reusable silicone straws. Each colour is fully safety tested to ensure a safe and toxin-free sip! - Comes with a biodegradable plant bristle cleaner, Vegan and plastic-free! - Includes a handy GOTS certified organic cotton travel pouch with a secure drawstring closure. Made from high-quality natural and thick organic cotton canvas. The travel pouch is also handy for carrying travel cutlery or other zero waste essentials. - No risk of micro-plastics! The bristles on the cleaning brush are made of plants and are safe for the ecosystem. If any bristles are released down the drain while washing, no plastic will enter our oceans. - Unlike microfibre bags, this organic cotton carry pouch will not release microplastics in the wash.
- An effective drinking aid for the elderly or those with drinking difficulties - straws are soft, flexible, adaptable. Made by ecoLiving, a friendly British company. 100% money-back guarantee and commitment to customer service. These straws are 100% reusable, however, at the end of their long life, you can return them to Boobalou who will recycle them with TerraCycle. Wash bag at 30c, line dry. Straws are dishwasher safe. Handwash cleaning brush and keep dry in-between use.